Anyone working in a call center knows how critical they are to a successful organization. However, many companies don’t know how to determine which Key Performance Indicators (KPIs) they need to focus on. We have created this guide to help call center professionals identify where to focus to maximize the value of their data. The place to start is to think about what your callers really want from your call center, and the best way to start is by looking at what they DON’T want from you. How do you measure the customer experience to ensure these things don’t happen? There are many KPI goals for a call center. Some of these KPIs are captured in the phone system, others require additional systems or processes to collect data, and others require that you marry up the data from multiple systems to give you a holistic picture. Business drivers typically involve the core functions of the organization or call center and revolve around business transactions. 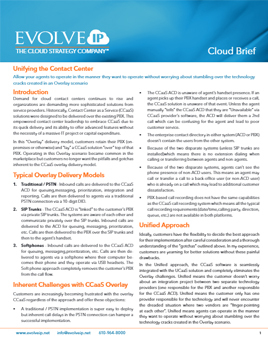 They often are combined with ACD information. Common drivers include cost per call, revenue per call, average call value, sales conversion rate, cross-sell, etc. Evolve IP’s customers often marry up phone/ACD data with the data from their CRM (or business applications) to produce these insightful business metrics. Quality Management typically involves a conscious and consistent effort to review each agent’s customer interactions, grade the agents, provide coaching/feedback, and operate continuously to improve agent performance. This evaluation includes customer service skills, product knowledge, system expertise/usage, and various efficiency and effectiveness measures to create an overall Call Quality score. The ultimate measurement regards the degree of loyalty your customers have for your organization. Would they recommend your services to their connections? This data is often captured via surveys, which can be post-call surveys or those that take other forms such as email or web-based surveys. Of course, a happy employee is critical to your organization. Employee satisfaction is also is directly related to customer satisfaction. If your employees are happy, they will provide friendlier, more helpful service to your customers. 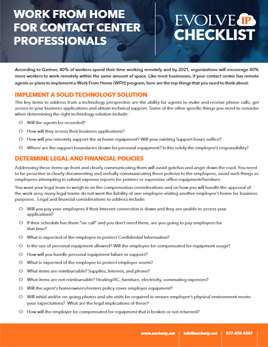 Moreover, your employee turnover will decrease, agent tenure increase, and hiring/training costs decrease. For customers that have deployed a WFM solution, metrics include forecast vs. actual volume, scheduled staff vs. actual, and agent adherence to schedule. 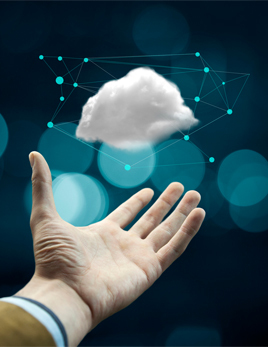 Evolve IP has customers using various WFM tools like IEX and Monet for forecasting and real-time adherence that are fed historical and real-time data by the ACD. This is calculated by taking the number of calls you answered within your goal (say 20 or 30 seconds) and dividing it by the number of calls received. This is indicative of the percent of callers that were answered within your organizational target goal. A common goal is to answer 80 percent of the calls within 20 seconds. We recommend that you look at this by interval, not as an average across all the intervals in a day. In other words, what percent of intervals did you hit your SL goal? That way, you ensure that the customer experience is consistent throughout the day. In many call centers, the first hour or two of the day (or last hour or two) will produce the worst results since they typically have the minimal amount of staff during those periods. During the middle of the day, when all the shifts are in the office, the results are phenomenal – making the overall results for the day look great. If you were one of those end of the day callers and you waited on hold for 10 minutes, would you consider that a great experience? That’s why you should look at the SL at all intervals of the day since a daily result can be misleading. The equation for this metric is the total caller delay divided by the total number of ACD calls. This serves as a substitute for Service Level. Because it is an average, it is very misleading – many callers are answered before the ASA, and many wait far longer. 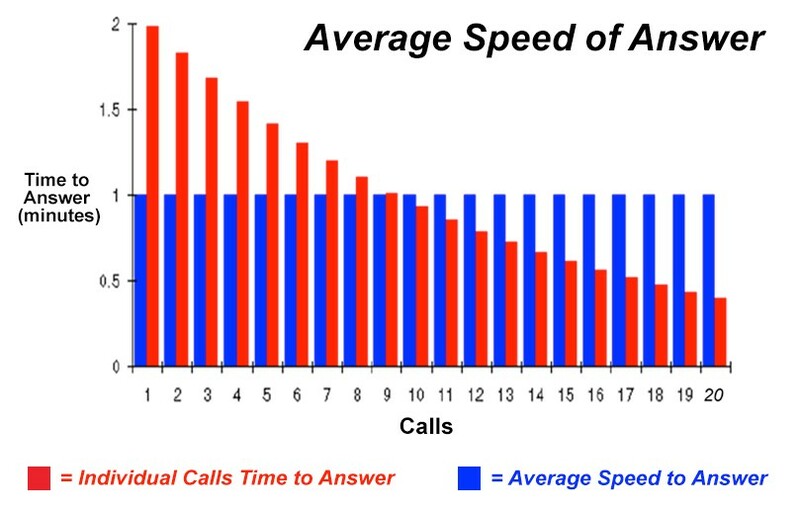 For example in the red/blue bar graph below, blue bars represent the ASA while the red bars represent individual caller’s wait times. If your call center is consistently hitting an 80/20 Service Level, your ASA will likely be about 15-17 seconds. However, that’s because many callers are answered right away without waiting. In reality, about 30 percent of those calls queued and there are quite a few callers that waited a few minutes to get answered. So the 15 or 17-second average really doesn’t represent as true of a picture of the customer experience. 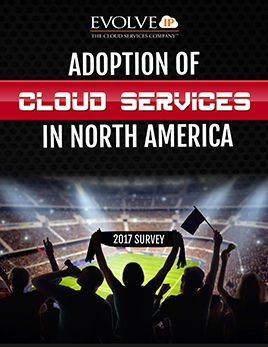 ASA should be considered a fallback position from Service Level since it is much less indicative of the true customer experience. The abandon rate is the inverse of the answer rate. These KPIs are secondary to Service Level & ASA, and more a byproduct of the staffing lined up to handle the incoming call volume. This KPI often represents caller behavior more than call center performance and you have far less control of this stat. I like to look at this KPI but not judge by it; it’s not black/white like ASA or Service Level. You can’t build staffing models to achieve an answer or abandon rate. There are many agent KPIs indicative of agent behavior that you can use to coach/mentor your staff to improve their performance. Some of these include: Average handle time, number of transferred calls, unavailability to answer inbound ACD calls, sign in / sign out time, number of outbound calls, and number of callers put on hold. This typically comes from quality monitoring performed by Supervisors or a separate QA team. If the agent is wowing your customer and excelling at your Quality Monitoring objectives like their customer service skills, product knowledge, and system expertise, haven’t they achieved nirvana? They are pros…they build rapport with the customer…they give them accurate information…they log everything in the system correctly….they move efficiently through the call…these are the things that the agent can control. Ultimately the agent’s handling of the call is one of the key factors in caller satisfaction. You should focus heavily on call quality and have on-going reviews of agent performance. You may spend more energy on your newer employees than your seasoned ones since the more tenured agents are more likely to behave in the manner you expect. The goal of a quality initiative is to raise the performance of all agents. Imagine if you could get the middle of the pack agents in your call center to perform like the top 10 percent of your agents. THAT would be a game changer and a crowning achievement for you. This is calculated based on the number of calls resolved upon initial contact divided by the total number of calls. 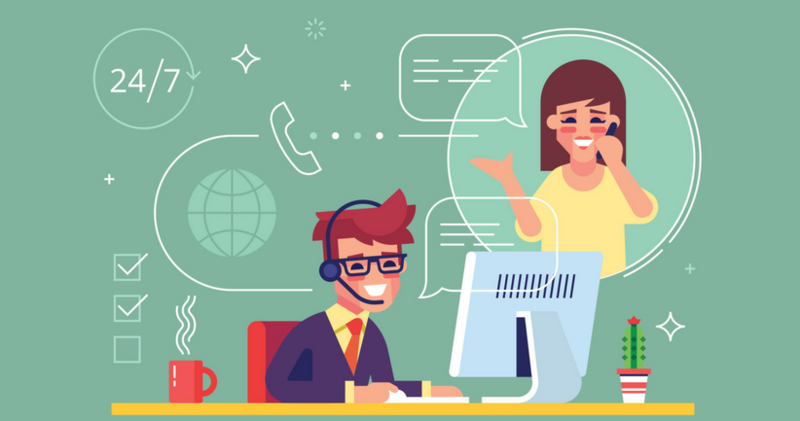 Since labor is the largest cost in any call center and every caller wants their question resolved right away, completing more and more calls as a “one and done” is key to cost and customer satisfaction. Evolve IP’s customers typically capture this information from either their CRM system or through the use of Disposition Codes tracked in the phone system. This is a critical component of customer satisfaction. This KPI comes from the marriage of workforce management (WFM) and the call center information to answer the question “Are my agents doing the right things at the right time?” This information comes from the WFM system after it’s fed real-time agent state information and compares that to the agent’s schedule. Are they making an outbound call when they are supposed to be available? Did they come back from lunch late? Are they available when their shift begins or are they still grabbing a cup of coffee in the break room? If agents are following their schedule, they are doing what you asked. So, now the responsibility falls back on you to make sure that you are generating accurate forecasts and schedules that align the right number of agents to meet your Service Level Goals. It is important to note that metrics aren’t always delivering exactly what we think they are. That’s why you need to understand the interrelationship between the various metrics and most importantly the impact on the customer’s experience. Believe it or not, all agents may not always have the customer’s best interests at heart. They may actually be more focused on their own success, their own wallet, and the KPIs you are using to motivate them. When that individual success is linked to the agent’s metrics you need to be careful, and you need to understand the data and make sure you have the right checks and balances. 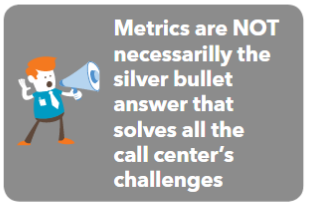 Metrics are not necessarily the silver bullet answer that solves all the call center’s challenges. In fact, managing exclusively by those KPIs may actually have an unintended and negative impact on your customer experience. This means that you need to understand the cause and effect and interdependencies between the various KPIs. For instance, if you manage your agents to an “average handle time (AHT)” KPI, they will hit that goal – but, you may not like the reason why. As an agent’s day unfolds and their AHT is too high, how will they get it back on track? 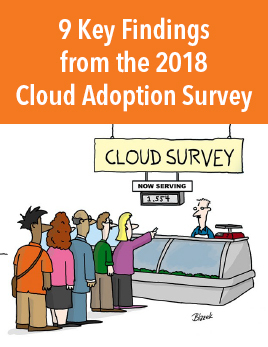 They are going to rush through customers; they are going to take shortcuts with some callers so that their overall AHT falls back in line with expectations. I’ve seen agents feign a bad phone connection and terminate the call, or put the customer on hold and then terminate the call blaming technology. Now the customer must call back and start all over again. That’s a horrific customer experience! Instead of judging an agent by AHT, calls per hour, or some other efficiency measure, consider adding some additional items to score your agents during your Quality Monitoring activities. Focus on their ability to control the call: did the agent take all steps possible to complete that call in an efficient manner? Coach them on how they could have better handled that call. Not only will the agent get the proper coaching & training that will achieve the same results, it will ultimately drive down AHT but in a healthy way. So, you might be wondering about setting higher goals, say moving from an 80/20 Service Level goal to a 90/20 Service Level goal? You’d answer more calls quickly and make more customers happy right? Seems like a great idea! Well, there is too much of a good thing too. Going back to the laws of physics and unfortunately, there are some opposing forces at play here too. To achieve a higher Service Level goal, you’ll need more people on the phones. Achieving 90 percent of anything is tougher than achieving 80 percent. As we all know, that last 10-20 percent of results requires much more effort than first 80 percent. This is the law of diminishing returns that applies everywhere in our lives. To increase your Service Level goals, you’ll need to add more staff to the phones, plain and simple. 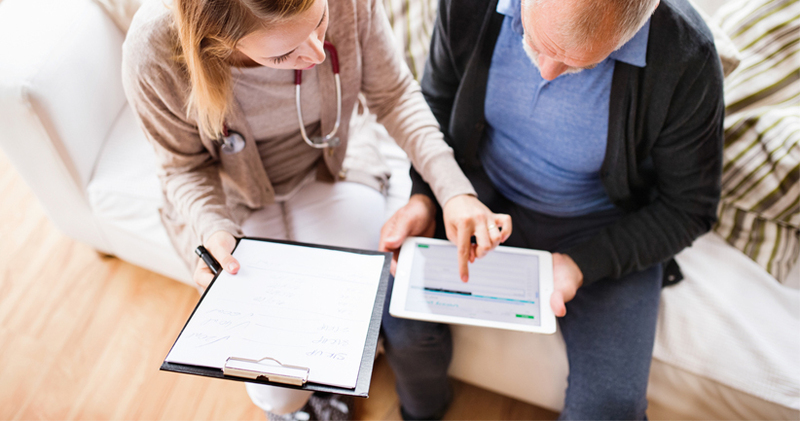 You’ll need to answer more calls more quickly, and staffing is the way to achieve that.  Let’s briefly talk about Occupancy, which is defined as “the percentage of time an agent is actually involved in call handling versus sitting in the idle state waiting for a call.” This is a function of call volume, staffing, and service goals. This can be interpreted as “productive inbound time on the phone.” So the more time agents spend on the phone, the higher their occupancy. 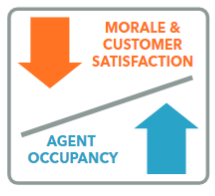 However, as you increase your Service Level goals, your overall agent occupancy goes down. It’s an inverse relationship. As more agents are added to the same call volume, their occupancy decreases because agents must spend more time sitting available for the next call in order to answer a higher percentage of the calls. Putting this all together, your call center’s performance goes up because you’ve added more agents and are achieving higher Service Level goals, your callers are happy, BUT your agent occupancy goes down and your overall cost goes up and agents spend less time on the phone. That’s the “opposite force” in this scenario, and YOU get to explain to your boss at your next budget review why more agents spending less time on the phone is a good thing. 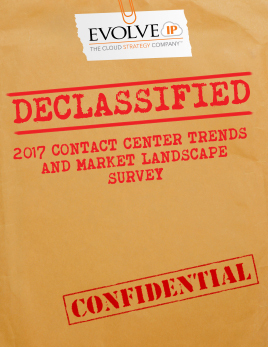 Let’s take that discussion a step further, considering employee satisfaction and focus on the impact of Occupancy on your call center agents. As agents spend a higher portion of their day on the phone, they become increasingly weary at the end of the day. The frenetic pace of answering dozens of calls in a day eventually gets to even the highest motivated agents. 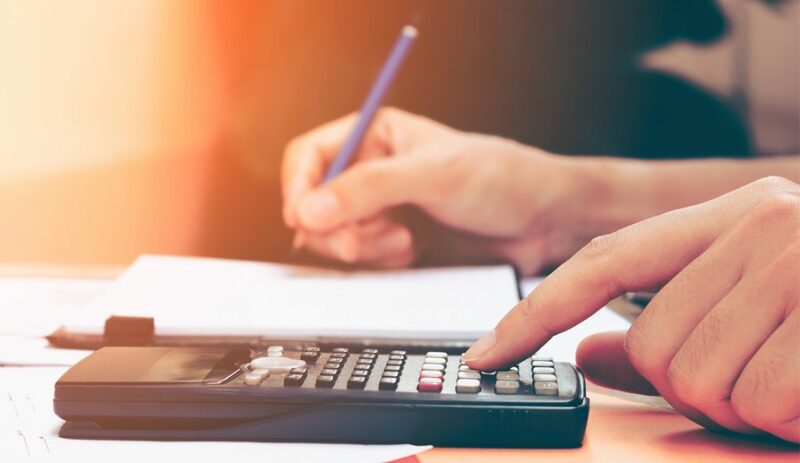 Now your CFO might say “I’m paying them 100 percent of their salary and I expect to see them on the phones 100 percent of the day.” We all know that’s not practical nor feasible in a call center. As agent occupancy goes up, employee motivation and morale goes down – and we all know a happy employee means a happy customer right. So, an unhappy employee means what kind of customer? NOT the kind you want. 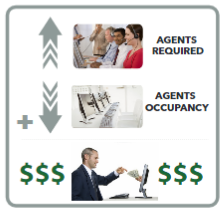 So, occupancy is actually in YOUR control, not the agents. So you need to find the right staffing and Service Level goals that keep your agents engaged and productive, but don’t lead to burning out and dissatisfaction. 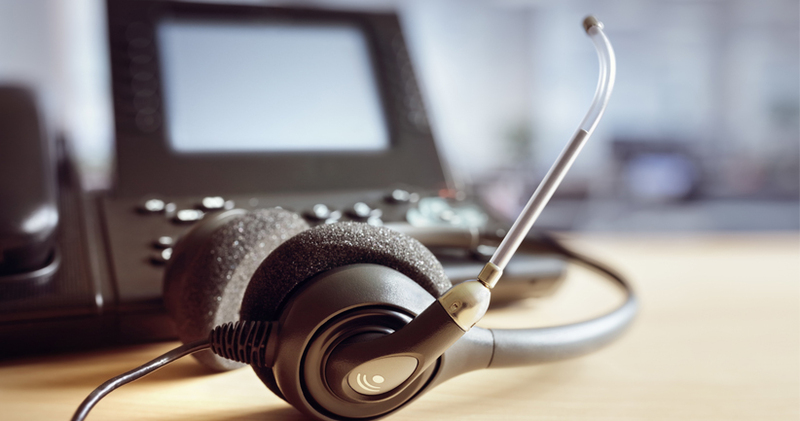 Now that you have learned about the KPIs that matter most to the call center, you might be interested in seeking a call center solution that enables you accurately and easily track these metrics. Learn more about Evolve IP’s Call Center Software. 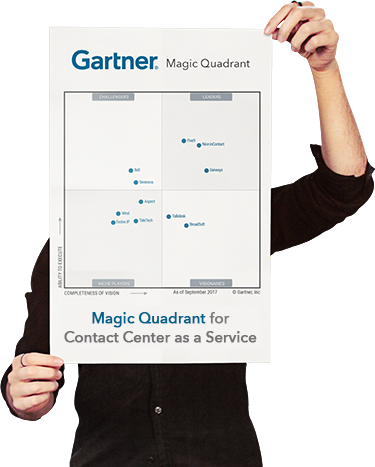 Evolve IP has been recognized in Gartner’s Magic Quadrant for Contact Center as a Service, North America. 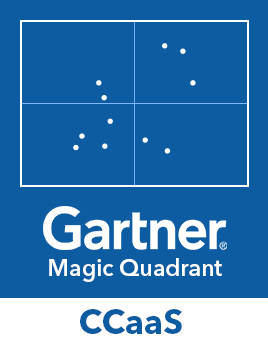 If you’re looking for 3rd party feedback on our award-winning solution read what Gartner has to say about us on pages 6-7 and see what our clients had to say about us with Gartner here. Read what customers have to say about us here.